The production of wooden materials requires less energy and is less polluting than common construction materials like steel or concrete. Thus, it is a further possible component for the carbon-neutral city. On the other hand, steel has the advantage of being exactly calculable. Its material behavior does not change when it comes to changing stress directions. Timber is directionally dependent. It implies different properties in different directions. In brief, timber is anisotropic and inhomogeneous. 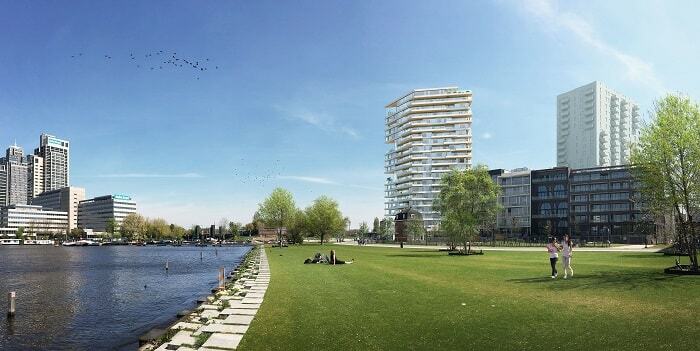 However, that does not prevent the construction of the 21-story timber tower HAUT by the Dutch river Amstel in Amsterdam, Netherlands. 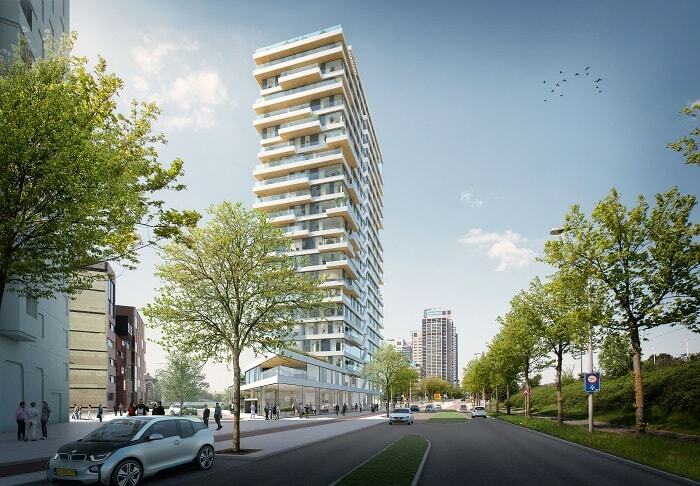 Chosen by the municipality of Amsterdam, Team V Architecture and brand partner NLE will develop this exceptional high-rise structure. HAUT certainly has the potential to become the tallest timber tower in the world if things go the way the designer Team V Architecture expects. The start of construction works of this innovative prototype is expected in the second half of 2017. The cycle storage space and underground car park have an area of about 2,800 m². With about 55 different sized apartments, the total gross floor area of the 73 m high building is roughly 14,500 m². The public urban winter garden in the base of the building improves the mental wellbeing. It is even possible for residents to grow their own vegetables. According to Team V Architecture, HAUT’s cross-laminated timber stores more than three million kilos of carbon dioxide. 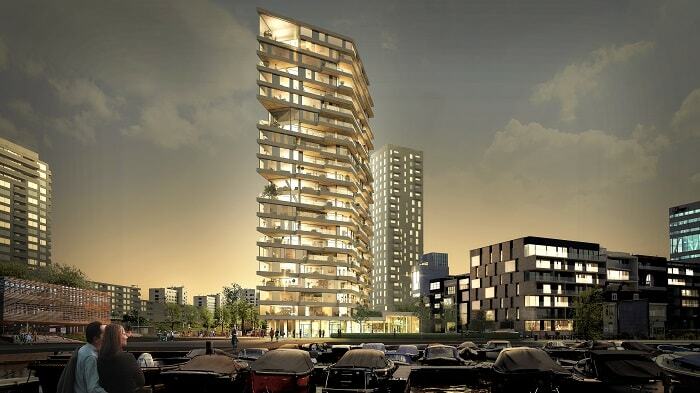 Together with energy-generating facades and the collected and purified wastewater, this timber tower is targeting for a BREEAM Outstanding rating – the highest possible sustainability grade for green buildings. 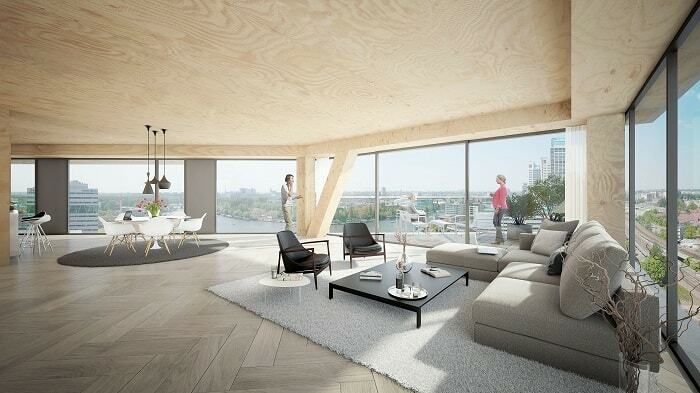 The timber tower HAUT is situated in Amsterdam’s residential neighborhood Amstelkwartier next to the River Amstel between Oud-Zuid and Watergraafsmeer. Additionally, the district will offer some 4,000 residential units in the near future, together with shopping opportunities and small business facilities. The new park Somerlust adjacent to the Amstel is also already open to the public. HAUT is not the first timber tower project in this magnitude. 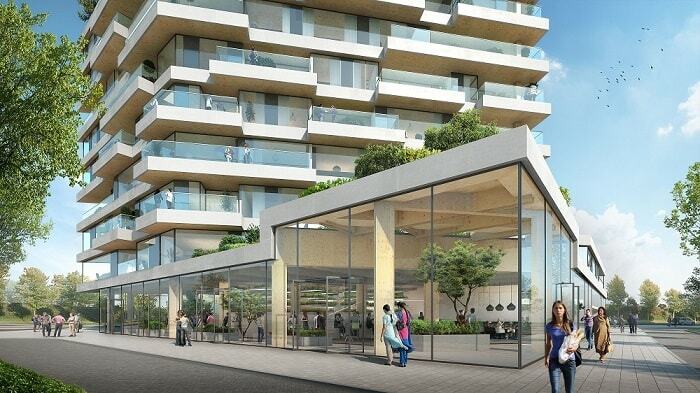 For instance, a further tall wooden building is situated in India. It is called Hyperions and already under construction.